WHAT IS THE TOUR: It is an Artists Tour in Buffalo. The Artists Tour gives patrons the opportunity to visit Buffalo’s art galleries and Artists. An opportunity to meet our outstanding artists, view and purchase their work. 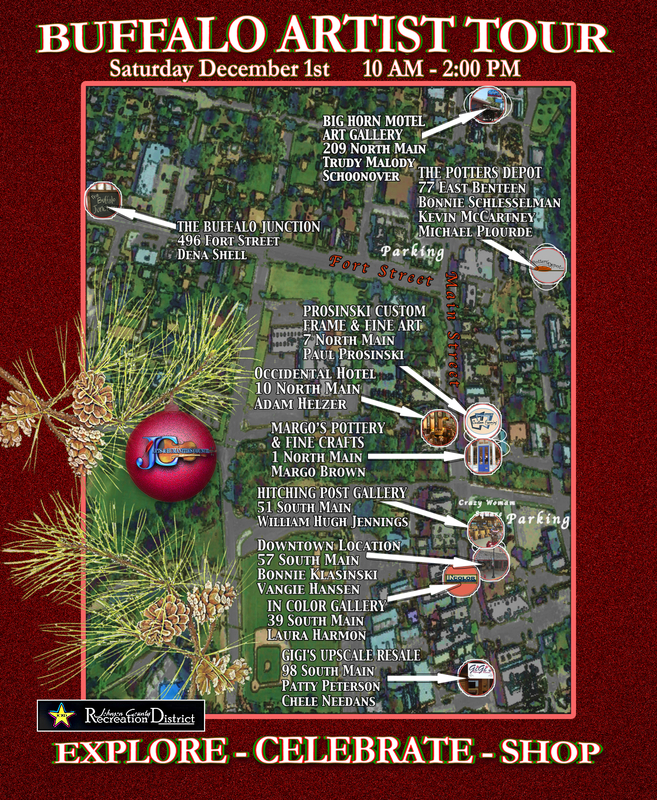 There are many events happening in Buffalo on December 1st. JCHAC GOAL: To promote and make aware the fine art Galleries and Artists here in Buffalo. JCAHC WILL: Create posters and maps. Promote individual Artists and Galleries. Advertise locally and in Sheridan. Promote the tour in multiple venues with the cooperation with the BDA in Buffalo. COSTS TO GALLERIES AND ARTISTS: If you are a member of JCACH, the cost is free. To become a member, the Cost of membership is only $10.00 Become a member here. ADVERTISE the tour where ever you can. You can get the posters on this page. 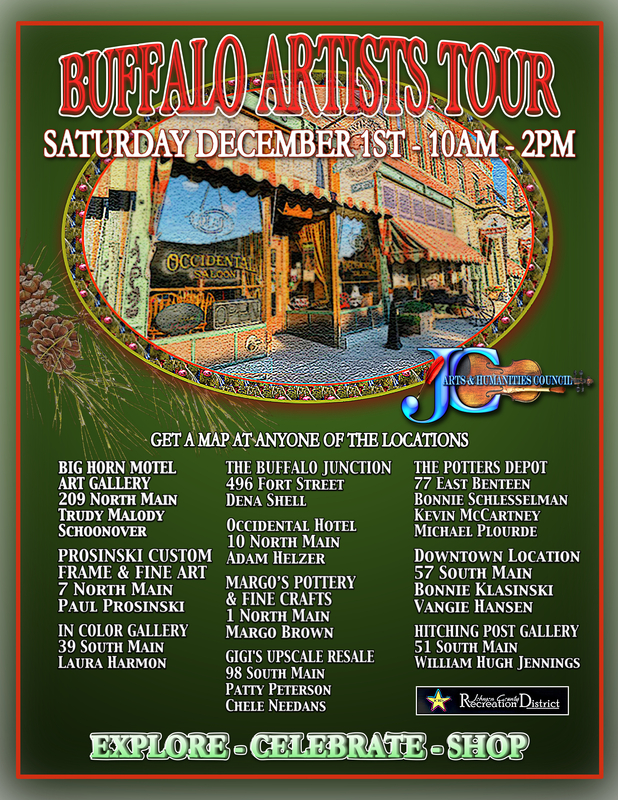 WHERE TO DISPLAY YOUR WORK FOR THE TOUR: If you are not represented by one of the galleries in Buffalo, visit with the local galleries about displaying your work during the tour. JCAHC has acquired the (former) Gigi’s building for the tour. If you would like to display and be a part of the tour, please register. There are only a couple of spots left here. There maybe a space at the Occidental Hotel lobby. Talk with them. BE THERE FROM 10:00 AM – 2:00 PM: You can visit with patrons, promote your work. sell and talk about your artwork. This is part of JCAHC’s goal. IF YOU ARE REPRESENTED BY ONE OF THE GALLERIES IN BUFFALO: Please participate by becoming a member of JCAHC and register for the tour. Your name will be advertised through all venues. Cost for membership is only $10.00 through December.